ArcMap provides the capability to join an Excel spreadsheet to a feature class with either the Join Data dialog box or the Add Join tool. For best performance, use the Join geoprocessing tools when working with large datasets. The instructions provided describe how to join an Excel spreadsheet (.xls) file to a feature class in ArcMap using the Join Data dialog box and the Add Join tool. 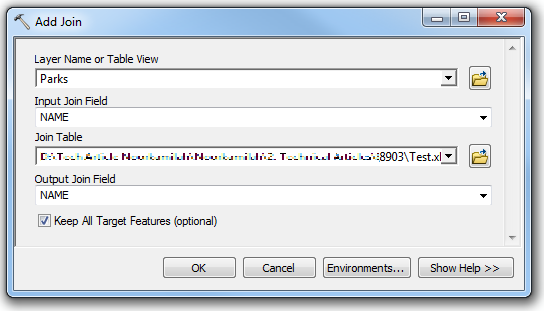 The Join Data dialog box is accessed by right-clicking a layer in ArcMap and selecting the Join option. Refer to the following document for steps to join an Excel spreadsheet to a feature class using the Join Data dialog box: Joining attributes in one table to another. The Add Join tool joins a layer to another layer or table based on a common field. Refer to the following document for more information on the Add Join tool: Add Join. In ArcToolbox, navigate to Data Management Tools > Joins > Add Join. In the Add Join dialog box, select the layer to join in the Layer Name or Table View. Select the Input Join Field in the drop-down menu. Select or browse for the Join Table. Select the Output Join Field from the drop-down menu. Optionally, check the checkbox for Keep All Target Features (optional). Joining an Excel spreadsheet to a feature class using the Join Data dialog box and Add Join tool outputs a temporary join. To make the join permanent, export the joined feature class to a new feature class or save the joined table view to a new table. Alternatively, use the Join Field tool to output a permanent join. Prior to joining an Excel spreadsheet to a feature class, the Excel spreadsheet must be formatted and meet certain standards. Refer to the following document for more information on formatting a Microsoft Excel table for use in ArcGIS: Formatting a table in Microsoft Excel for use in ArcGIS. The fields used in the join from the Excel spreadsheet and the feature class must be of the same data type, such as text, date, or number. To check the data type of a field, right-click the feature class in the Table Of Contents and select Properties > Fields > the data type for each field is listed in the Field Details section. Use the same method to check the data type of the Excel spreadsheet fields. Insert a temporary blank column B. In cell B2, type =TEXT(A2,"0"). Select cell B2 and copy the formula in the cell by using the fill handle to fill B3:B100. Press Ctrl+C on the keyboard to copy and navigate to Home > Paste > Paste Special > select the Values option and click OK. The entries in column B are now text versions of the numbers in column A.
Right-click in column A and select Paste. Delete the temporary column B. The name of the .xls file and the name of the worksheet must not have spaces or special characters other than underscores, and must not begin with a number. Row 1 in an Excel spreadsheet is read as field names in ArcMap. In order to successfully join the spreadsheet to a feature class in ArcMap, the first row of the spreadsheet must not contain spaces, special characters other than underscores, and must not begin with a number.